I'm not a train geek. Before you all roll your eyes and giggle into your hands, it's true. I don't know anything about classes, signals or tracks. I'm not interested in train numbers, and the only trains I recognise are wretched Pacers (spit) and the Desiros I used to take to work every day. I like train stations; I like train lines. I like their connectivity and their community. I'm not completely immune to the charms of a nice train though, and as I waited at Wilmslow station I couldn't help myself. The trains on the line from Manchester Piccadilly to Crewe are Class 323 trains (I looked it up, alright?) and all day I'd been seduced by their silky electric whirrs. The noise was similar to the gentle purr of Jubilee line trains, something that Ian beautifully covered in his 150 Great Things About the Underground blog (only eight more to go, folks!). It hisses and clicks, then it rolls, then it sighs into a soft hum. It was a wonderful sound, and I did something I've only done once before: I recorded the noise. And then a Pendolino rushed through the station at 0:20 and fucked it all up, but still: it was great up until that point. I totally accept that recording the noise of a train is a very odd thing to do, but please, play that a high volume and appreciate its magnificence. (The only other time I've recorded the noise of a train was on the Jubilee Line. Obviously). I finally boarded one of these electric seductresses and headed down the line to Handforth. I had absolutely no expectations; I only knew it as a place on the map. 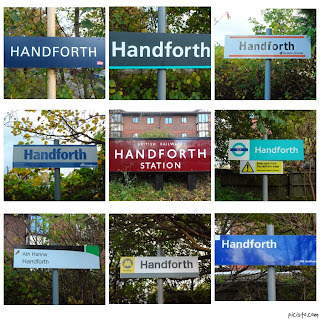 So I was delighted to find that it had a devoted Friends of Handforth Station group who'd gussied it up quite considerably. There was a fly in Handforth's ointment though, a big, dirty, offensive one. There was also, allegedly, a "London Underground" sign on the platform. First of all the Underground doesn't use signs like that. Secondly, they don't use a font like that, and I can't believe they're trying to get away with it. Designed by Edward Johnston, the London Underground font is so distinctive that even recently discovered Brazilian tribespeople would recognise where it was from. Johnston Sans (and its various modernised versions) is easily one of the most beautiful fonts ever created; if I could, this entire blog would be written in it. My whole life would be written in it. This abomination disgusts me, and for the sake of human decency I should have ripped it down and burnt it there and then. Was that a bit of an overreaction? Possibly. With that nasty taste in my mouth, I took in the station itself, which is a perfectly acceptable pre-fab type building - functional, clean, not going to win any awards but it does the job. By this point I was starting to get a bit tired of Handforth station. It's very nice that they have a loyal, enthusiastic band of volunteers, but the train weather vane and the medieval sign and the conifers all pushed me over the edge. It was just too much; the difference between having a gnome in your back garden and having an entire family of miniature people arranged around a fairy mushroom. The Millennium screen and the Golden Jubilee artwork provided by local schoolchildren and another heritage sign and... JUST STOP. Incidentally, the ticket office is only open Monday to Saturday mornings (not Sunday), and there's no way to get down to the platforms if you're in a wheelchair. I'd prefer a proper working station to one that's got its own flag. I finally dragged myself away and headed off for my final station of the day, Styal. Passing another kitchen and bespoke furniture shop - I was officially out of the Golden Triangle now, but its influence was still felt - I headed into a quiet residential road. As I walked, I slipped down the social scale with dizzying speed. At the Handforth end, there were detached homes with gardens. Swiftly these changed to semi-detached houses, some of whom had concreted over the grass for more parking, then the gates vanished to reveal open driveways. The road seemed to end at a row of trees, but a footpath took you round the corner and into a council estate. A nice council estate, with cul-de-sacs and sheltered housing for the elderly, but it was still a bit like stepping over the border from West to East Berlin. Beyond that the road turn to mush. Rain and mud were churned up on a back road through fields of horses. There was a smell of manure and no noise. It's always surprising how quickly you can find yourself in the countryside in England. Nature is only temporarily held back - turn a corner or find a spot of derelict land and it comes rushing back. We're living with a benevolent dictator, allowing us to temporarily occupy some of its space, but the earth could take it back any time. I skipped across brown puddles and found myself behind Styal Golf Course. The greens were busy as sportsmen tried to fit in as many games as possible before winter struck and condemned them to the clubhouse. Styal station appeared on my right, but I was early for the afternoon service so I carried on to the village beyond in the hope that there was a pub or a cafe. Imagine the collective pearl clutching that went on when that sign went up! There wasn't much else to keep my interest so I headed back to the station to wait. Styal used to get a pretty good service, but the construction of the Manchester Airport spur stole its thunder. That station was much more convenient, and got better services, so Styal was quietly allowed to run down to its current three trains a day. The 15:59 was the only service in the afternoon. The sky was darkening; a reminder that I'd have to be pretty swift if I wanted to collect stations after lunch from now on. I'd thought about continuing onto Cheadle Hulme, but the encroaching night put me off. 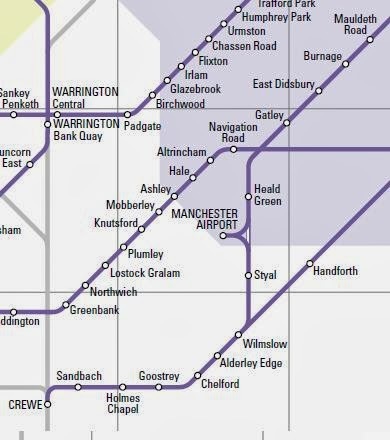 Plus, collecting Styal meant that I now had the whole of the line from Crewe to Maudleth Road under my belt; quite a significant chunk of the bottom corner of the map. I huddled myself against the cold and turned up my iPod. Another line gone. Another reason to smile. I suppose I am a train geek after all. 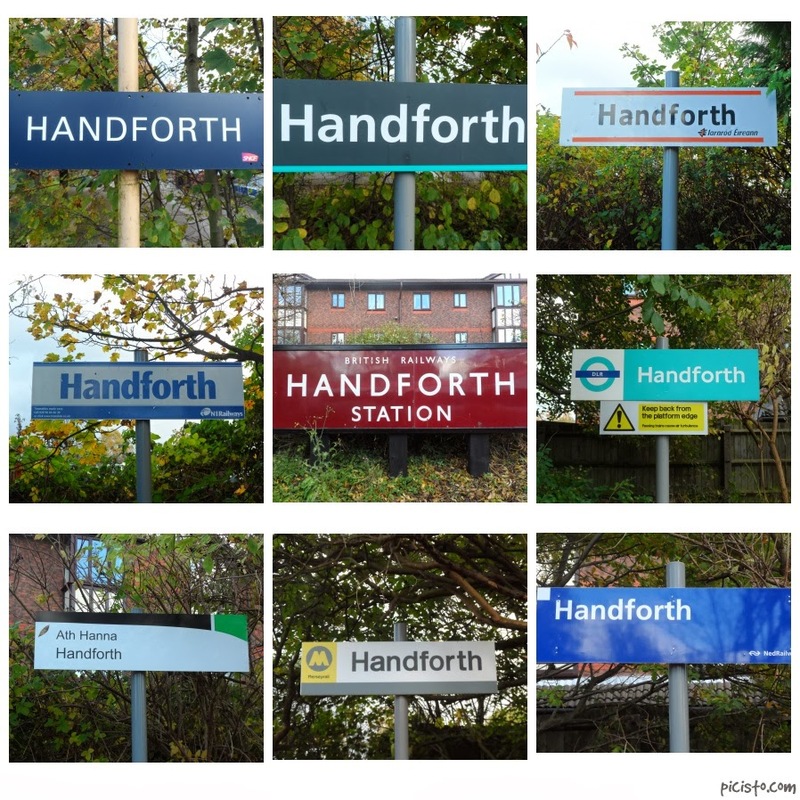 Handforth appears to be in Verdana, which would be the sans serif font that a printer defaults to if it can't find Johnston Sans or if Johnston Sans was locked to prevent printing. Still, there's no excuse for it. Even Gill Sans would've been better. Gill Sans is my "oh alright I'll settle for this" font, as anyone who's ever received a letter from me can attest. OHMYGOD THOSE SIGNS ARE JUST ABOUT THE COOLEST THING EVER! Except the Underground one of course. Seriously can't believe I've never heard of this station and it's collection. Must have been pretty tricky, well done them! You can kind of tell they approached the DLR after LU rejected them! Very interesting about the signs - the bottom left one is a green line sign. Regarding a possible trip to Ireland (as discussed under My Glittering Evening) my thoughts on bagging the DART stations would be a mix of visiting stations and hopping on the next DART (some stations and their localities are unremarkable) and staying a few hours and sampling the wider locality at others. And perhaps an end to end run at either the start or finish to serve as a recap/ appreciation. The original DART line was Howth to Bray but it was extended to Malahide and Greystones subsequently. A nice start may be to enter the country at Dun Laoghaire as it has a lot of history and was the traditional point of departure - the Dublin Airport of its day. Nowadays the Stena Line fast ferry only runs in the Summer and at Christmas, but a trip on this revolutionary vessel is interesting - it's just a pity fuel prices have rocketed meaning a slower one sailing a day each way is possible. A SailRail ticket can be bought from any Merseyrail station to Dún Laoghaire or to Dublin Connolly. These tickets can also be bought online e.g. Arriva Trains Wales website has a special section. Have a few friends in South Liverpool so have bought these tickets myself - though if buying at a smaller Merseyrail station I try to go at a quiet time because the transaction can take a few minutes and sometimes the clerk may need to look it up. The ferry direct from Liverpool to Dublin is an option with a car but none of them carry foot passengers. Back to the DART - Dún Laoghaire has fine piers - the East Pier is a must do - its Geographical pointer. The town is only a stone's throw and has loads of shops and places to eat. There's also a maritime museum and there are plans for an Irish Diaspora Centre on the original (Carlisle) mailboat pier. The structures on this pier were rased a few years ago. The pier rail station was here. The next station south of Greystones (not on DART) is Kilcoole and is only served at peak times. It's right beside the coast. Across the border north of Newry on the Dublin-Belfast line Scarva and Poyntzpass are also only served by, I think, two trains to Belfast in the morning and two back in the evening. Buses can generally help "fill the gaps" in terms of getting to/from these locations.The Belfast line runs along the coast from Dublin to Laytown and crosses the Boyne high above the town of Drogheda. North of Dundalk it enters the foothills of the Mourne mountains. Hope this info gives a flavour. Feel free to flag up any future visit and I'll try to help with any information. PS: green line sign as in Luas tram line. Oops when I posted the PS the Blogger system somehow removed my previous longer post. Very interesting re the station signs-the bottom left sign is a Luas green line one. Regarding a possible Ireland trip (discussed under a glittering evening) a good starting point may be Dun Laoghaire. It was the Dublin Airport of its day as the country’s key point of arrival and departure (the mailboat to Holyhead and Irish Mail train). The first railway in Ireland ran from Dún Laoghaire (then Kingstown) to Westland Row (Pearse) and opened on 17th December 1834. A SailRail ticket from Merseyside to Dún Laoghaire or Connolly can be purchased at any staffed station or bought online (e.g. Arriva Trains Wales website). Have a few friends in South Liverpool so have bought these tickets myself but if buying at a local merseyrail station I try to go at a “quiet time” as the transaction can take a few minutes and the clerk may have to look it up on the system. These days there’s only a sailing from Holyhead to Dún Laoghaire in the Summer and at Christmas (the Stena Line HSS Stena Explorer). In the 1990s it was marketed as a marine motorway when the revolutionary high speed sea service craft was introduced and made four/five crossings each way daily. The platform at Dún Laoghaire station would sometimes be full of passengers off the HSS. The HSS is a nice way to arrive. A few miles off the coast Kish Bank lighthouse is passed and then the huge granite arms of Dun Laoghaire Harbour appear to stretch out to welcome visitors. The East Pier is a popular walk with a geographical pointer and several other features. The town of Dún Laoghaire is worth sampling awhile – shops, places to eat and a maritime museum. There’s even a local ferry to Howth (Dublin in the winter) and special tickets giving a discount on the DART are available (i.e. one way by ferry, the other by DART). The original mailboat pier – the Carlisle Pier – still stands but all structures on it including the trainshed of the pier station were razed a few years ago. There’s plans for an Irish Diaspora centre on it. Kilcoole the next station south but not on the Dart is right beside the coast and has a service just in the morning and evenings. The Belfast line runs along the coast most of the way to Laytown and crosses the Boyne high above the town of Drogheda just north of that station. North of Dundalk the train runs along the foothills of the Mourne mountains. Poyntzpass and Scarva are two stations north of Newry just served by two trains each way (commuting into Belfast). The “gaps” in terms of getting to or from spots like these can be filled by using bus services. In Belfast the Dublin train terminates at Central but Great Victoria Street (only reopened in the 1990s) is more central for the city. I’ve heard good reports about the overnight Stena Line ferry from Liverpool to Birkenhead (cabin included). Metro bus 96 runs from central Belfast to the port while at the Twelve Quays Birkenhead end a shuttle bus runs to Hamilton Square. Hope this helps/gives a flavour – feel free to flag any visit and I’ll try to help by way of any further information. First of all, Irish Reader - why so shy? We're all friends here! Secondly, that sounds like an excellent itinerary, and has got me juiced for Round Ireland We Go even more. I'll try not to think of the expense! The only thing is, I know you say some of the locales are dull, but that doesn't matter: I'd still have to go there. I'm a completist (/nutter). Thirdly, have you ever given thought to doing that yourself? You seem to have it all planned out. Free blog links are available! I'm glad my info has whetted your appetite to visit the Emerald Isle.Indeed I would agree with visiting all stations and the DART allows for a very brief "just get the sign snap, then next train" visit or a more leisurely sampling and engagement with the wider locale - a must for the likes of Dun Laoghaire, Howth etc... A combination of station visits and a run through the whole line as a recap midways or at the end. Thanks for the blog links offer. I hadn't thought of doing it myself and appreciate the idea but having already been to several of the areas/stations I would feel a visit to write a blog would be artificial in some ways. At the moment I want to finish some other "projects"!. We had station data published here in the last week or so - like the station usage stats over there except this one was for a typical day (rather than a year). A fact deduced is that the station of Attymon in the east of County Galway (Galway-Athlone-Dublin line) appears to be the least used station. It had a total of 3 passengers on the day of the count. Irish Reader you could use Name/URL, it doesn't actually need a URL. Scott there's an open-source version of Johnston, called Railway Sans. Don't use Gill Sans, it's crap, the same glyph is used for 1, I and l and that's ridiculous. Ooh. If you have access to your site's CSS, you might actually be able to present this blog in Railway Sans! There's example code for inclusion in CSS for this purpose. I have no idea how to fiddle with CSS, Tasmanian. But now you have tempted me with this beautiful prospect I SHALL LEARN.